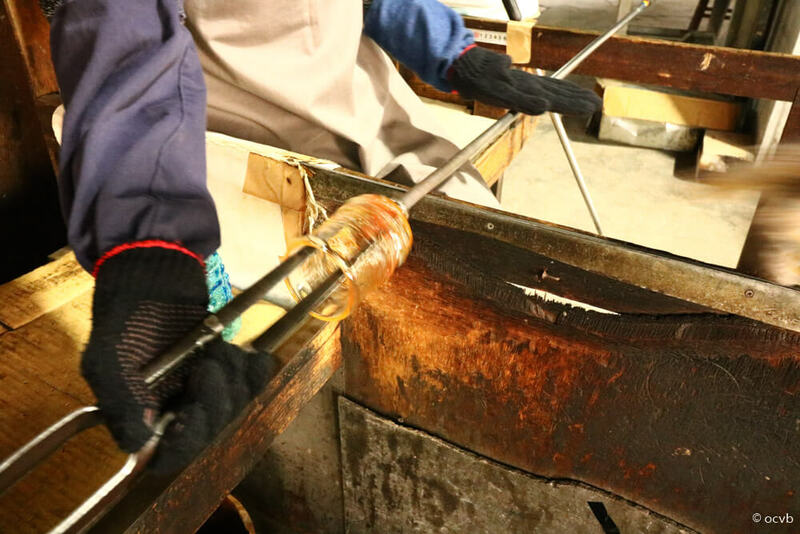 > Categories > Shopping > 【Blog】The original glass making program at the glass workshop! 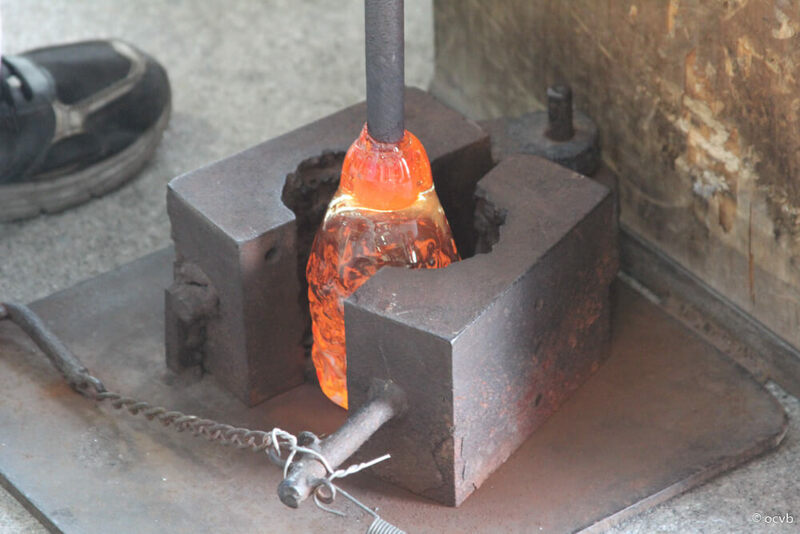 I gave the original glass making program a try at the glass workshop! 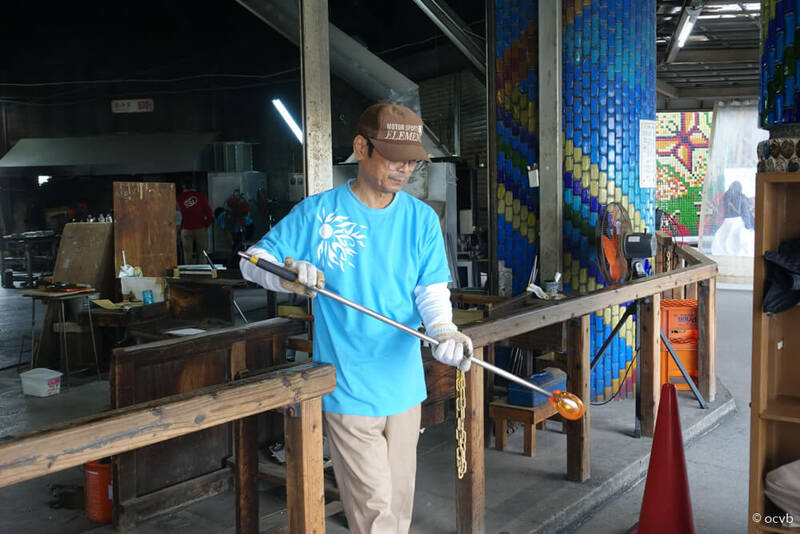 I visited the Ryukyu Glass Village in Itoman City. 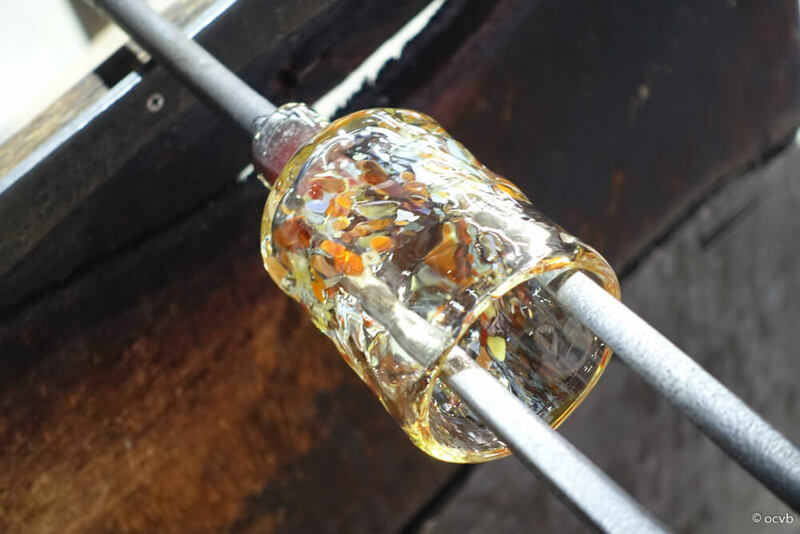 Here you can get an up-close look at the skills of glass craftsmen and give glass making a try for yourself! 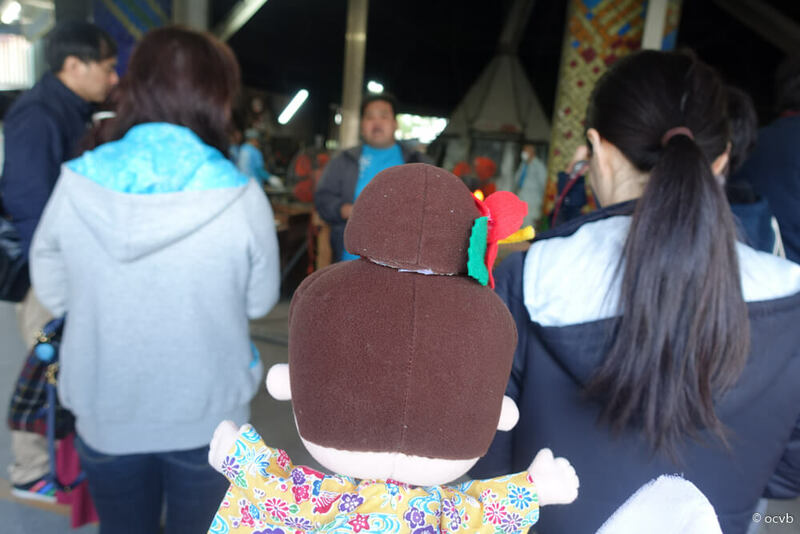 After enjoying a cup of coffee at Fukuji Shoten, I took part in the popular glass making program! 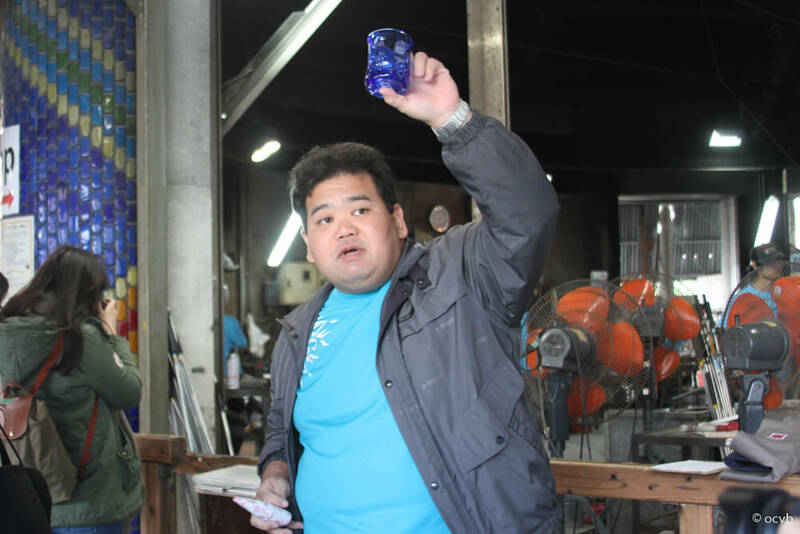 Ryukyu Glass is a traditional craft that is said to have taken form as a result of the propagation of techniques from outside the prefecture during the Meiji era, which later took on a uniquely Okinawan style with the incorporation of colorful glass bottles discarded by the US military. 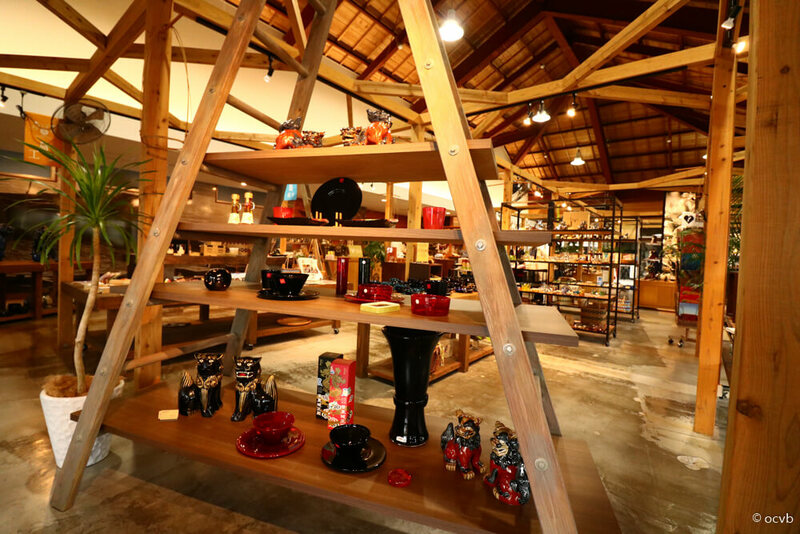 ▲ Fukuji Shoten opened in May of last year. 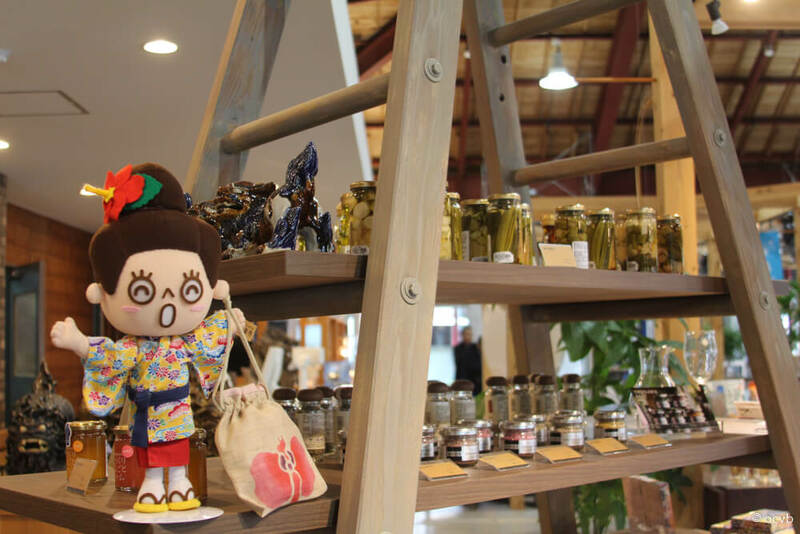 Among the carefully selected items that line the shelves, you can find original items that are only sold here. 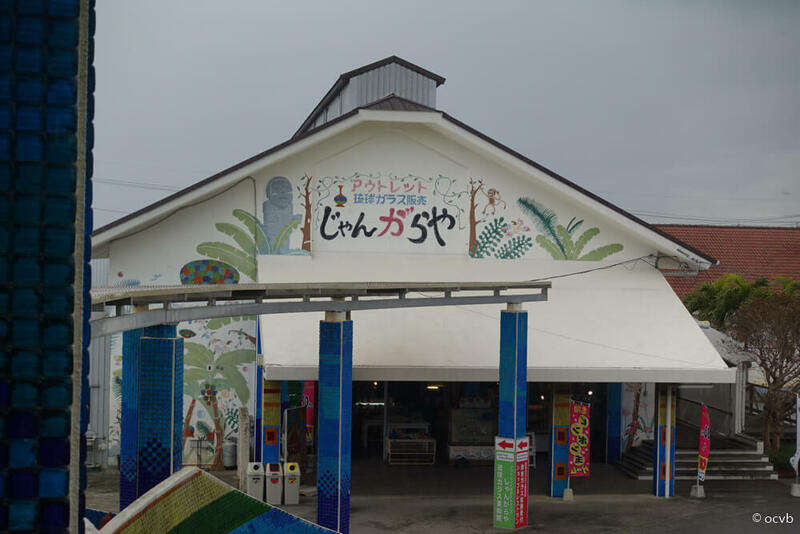 Located at the entrance facing Route 331, Fukuji Shoten sells a variety of handpicked products from the local area of Itoman as well as other regions, including crafts and delicious food items. I was really digging it. There’s a café in one corner of the shop. They have light meals and drinks. 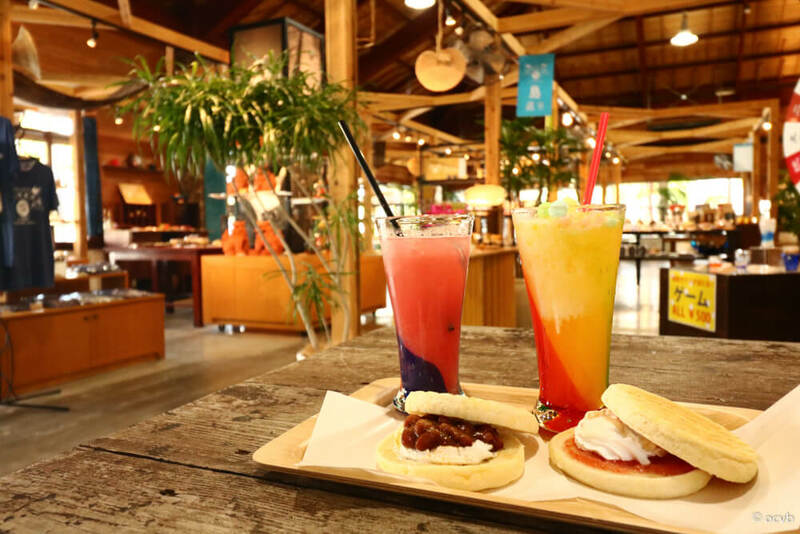 ▲ This is the café inside Fukuji Shoten. 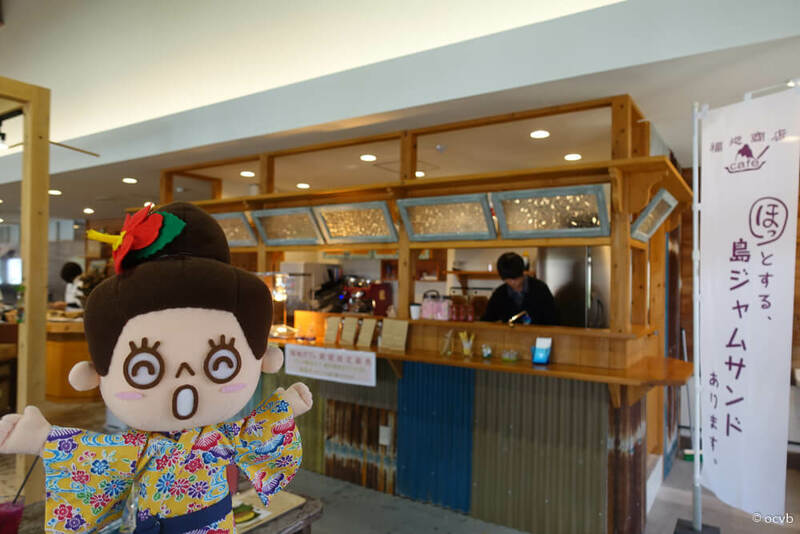 You can order at the counter and take a seat to enjoy your food. 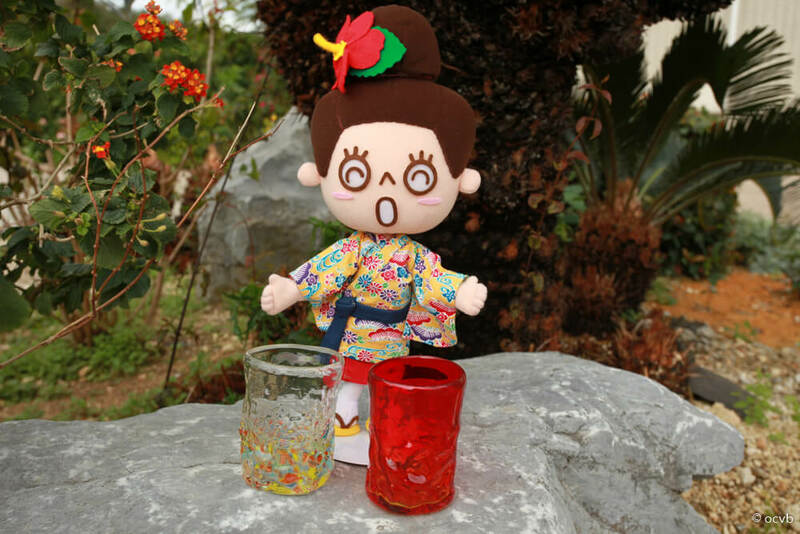 Drinks poured into Ryukyu Glass are so colorful and attractive that you won’t be able to help yourself from snapping pictures. 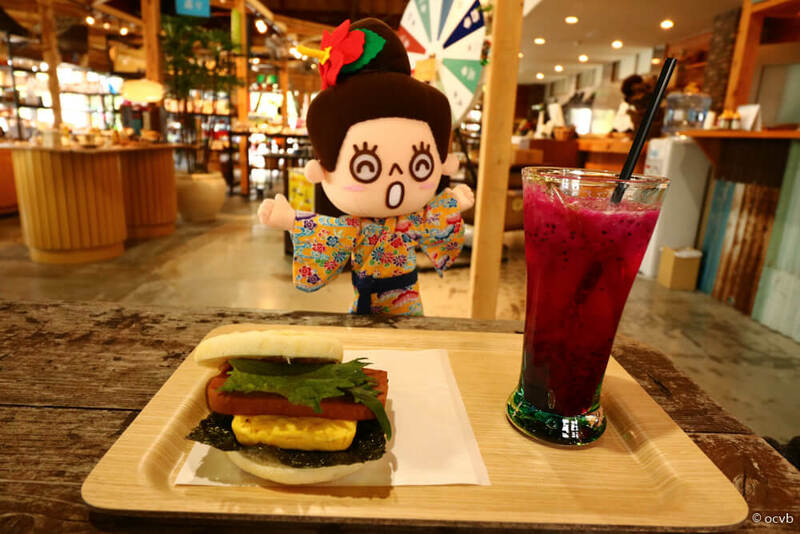 I ordered the SPAM and egg sandwich with the dragon fruit cider. The dragon fruit cider is both sweet and sour, and so refreshing! ▲ Seen here are the red kidney bean sandwich, guava sandwich, guava cider, and mango cider. 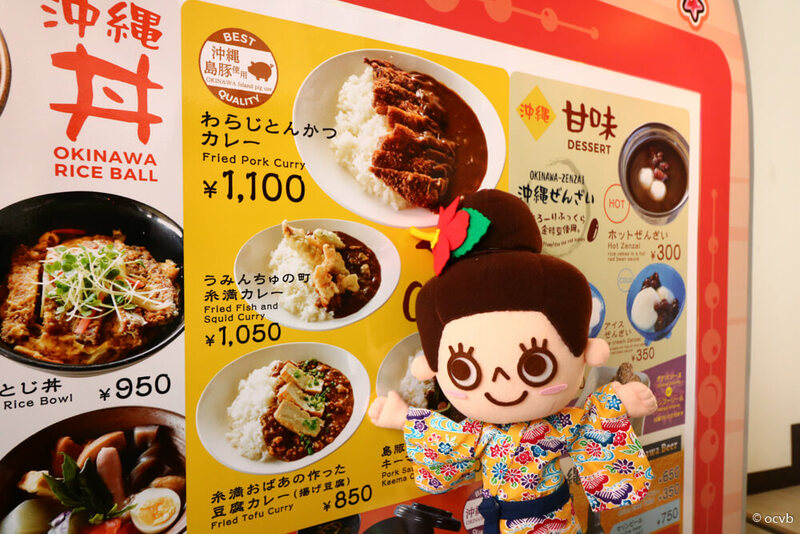 You can enjoy the unique taste of Okinawa, including the most popular “Uminchu no Machi Itoman Curry”! 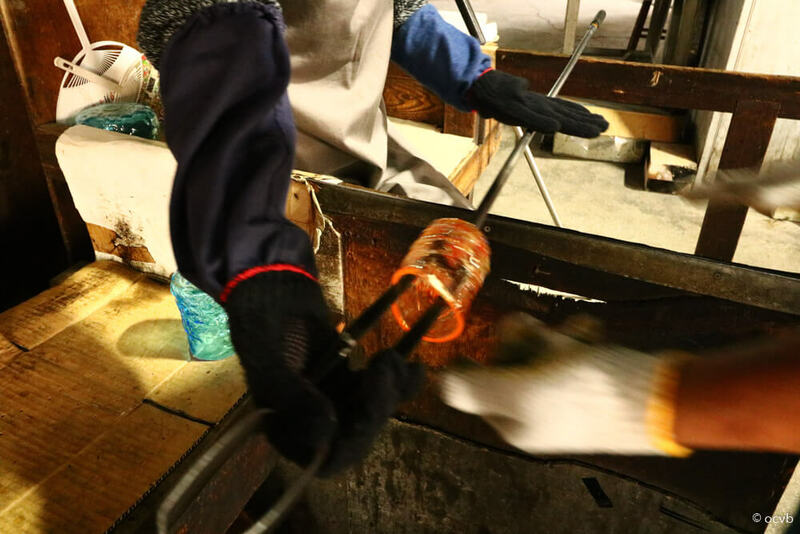 Past Fukuji Shoten is the glass workshop, where you can get an up-close look at the mastery of the craftsmen. 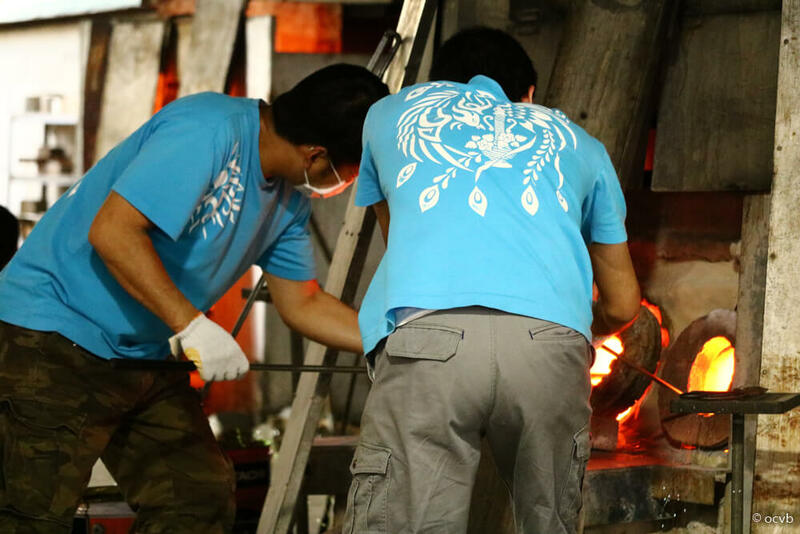 Glass pieces melted like glazing in a pot heated up to 1,300 degrees celcius are the raw materials used for the craft. 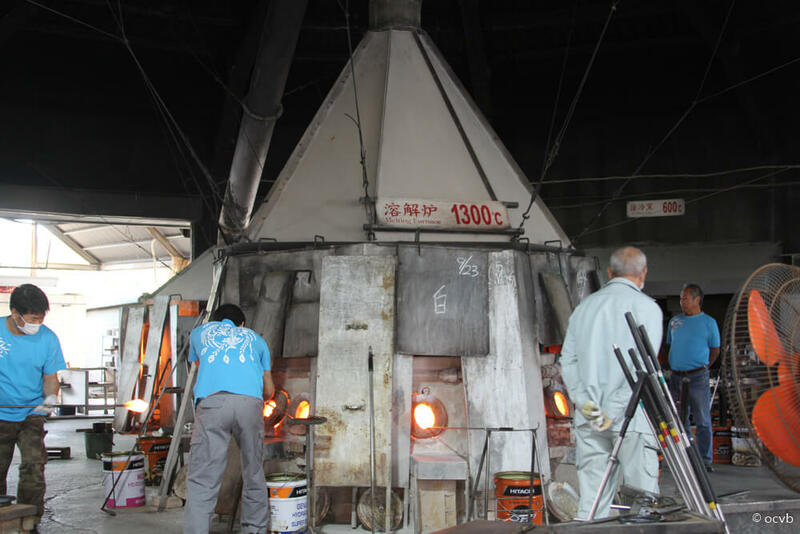 ▲ Seen here is a melting furnace standing tall in the center of the glass workshop. You can feel the warmth even in the middle of winter. You can peek into the workshop to see the craftsmen hard at work with intense precision. The craftsmen seem to work skillfully on each and every piece. 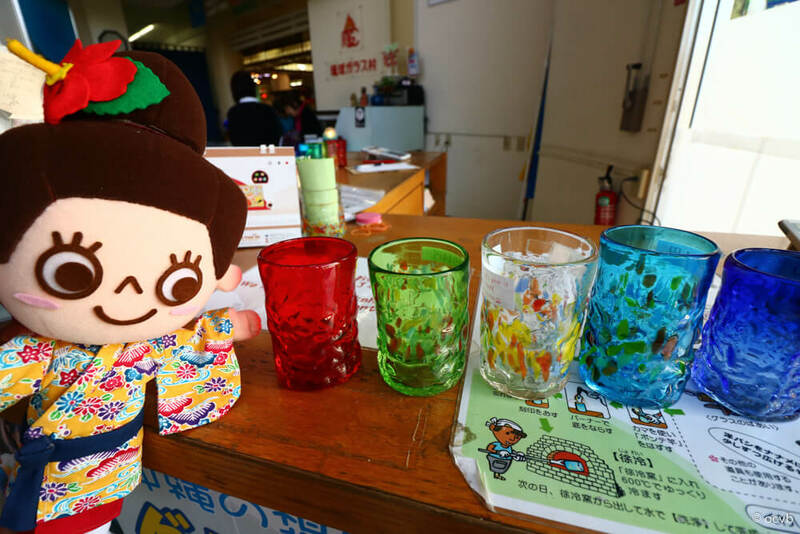 First, choose the colors for the glass. I went with the colors in the middle! After you get a number ticket at the reception desk, wait in front of the glass workshop with everyone else! 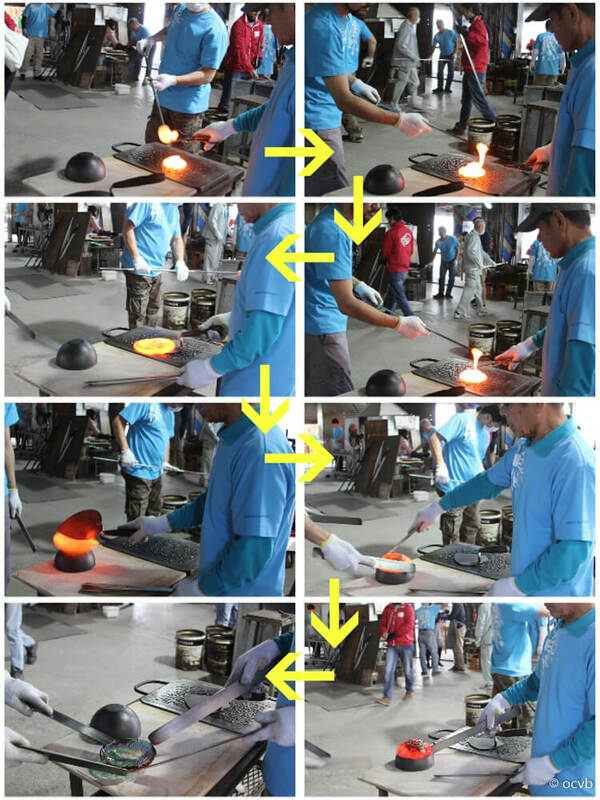 You will first receive instructions on the steps and precautions involved in glass making. 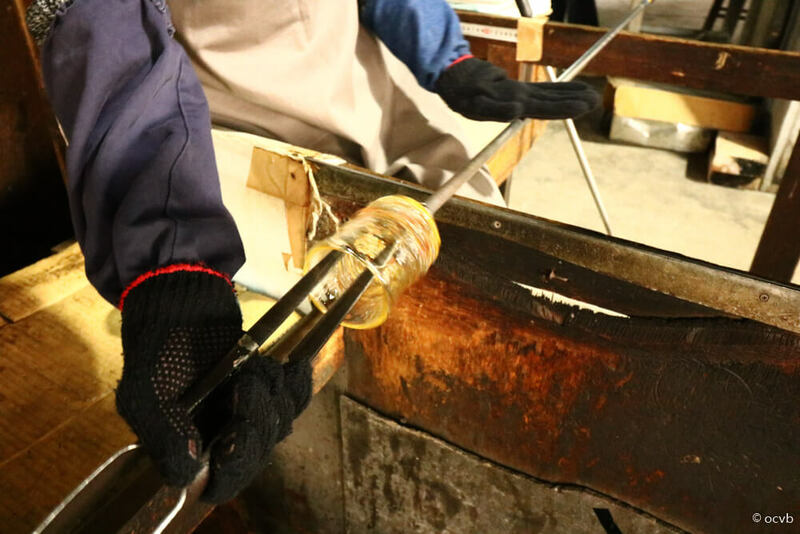 The craftsman wraps the glass around the tip of the blowing iron. Here it is! The moment of excitement! Blow at the instruction of the craftsman. 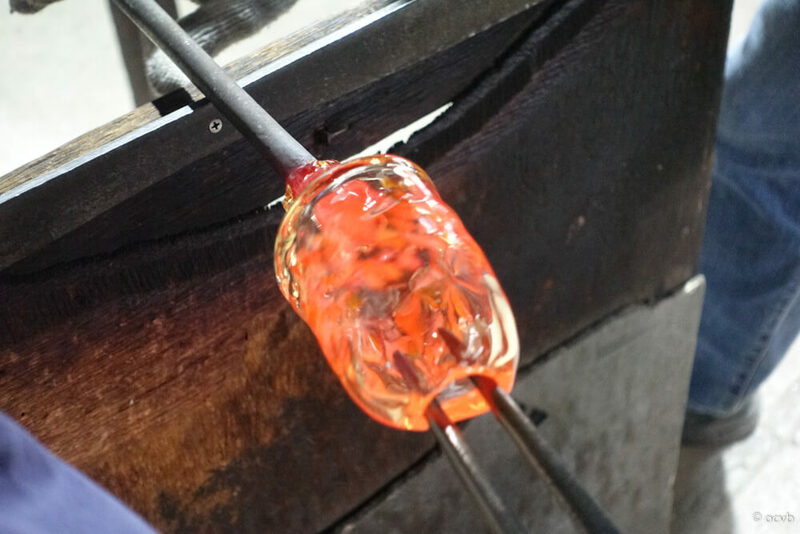 It’s all blown up♪ And the glassblowing part is complete. ▲ The mold features a pattern, which takes on a stunning form as it is blown up. Reheat to soften, then prepare the spout. 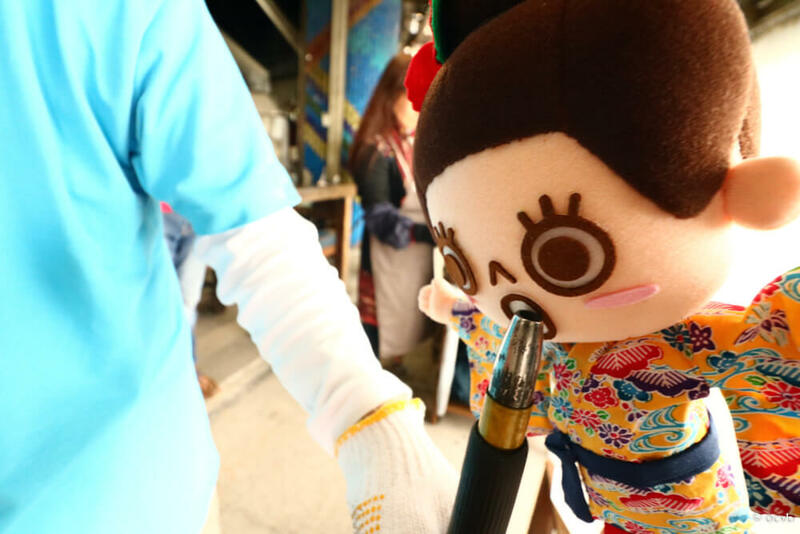 This is an important task that determines the quality of the final product! With a pair of scissors in your right hand, turn the rod back and forth with your left hand. While It’s not easy to move both hands at the same time, there’s no worry, because the craftsman will guide you along the way. 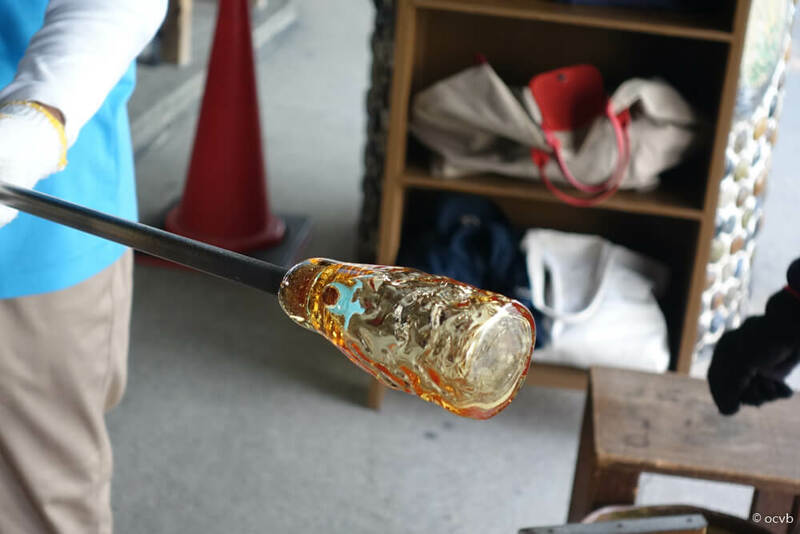 As the glass cools and solidifies, the color gradually begins to change. My glass is finally ready! 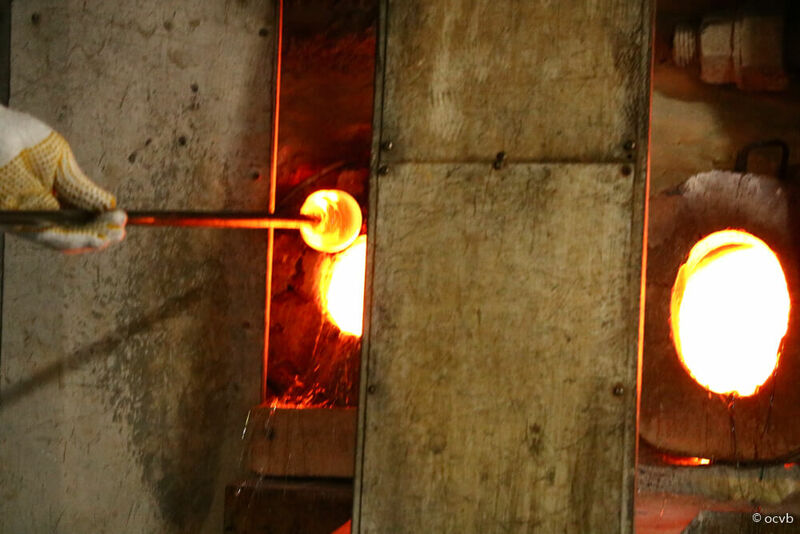 The glasses are then slowly cooled in a kiln known as an annealing furnace. My handmade glasses have arrived! You can pick up the finished pieces in person after three days. You can also have them mailed across Japan or overseas! 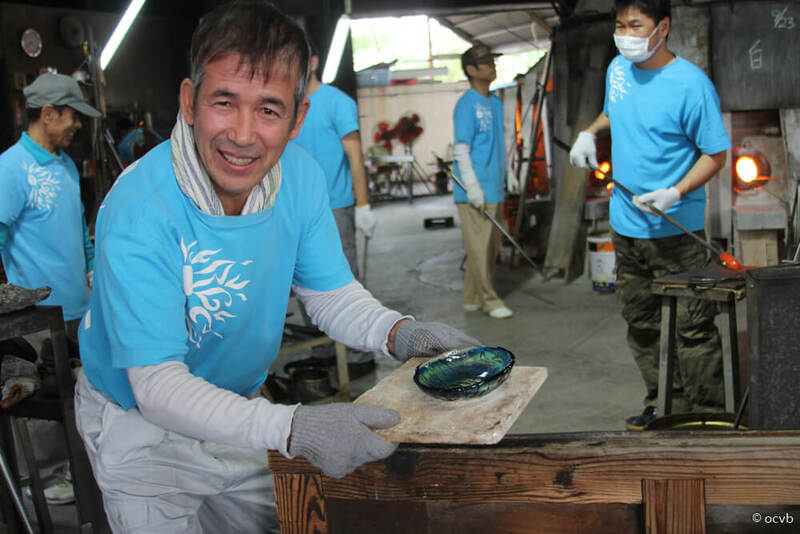 There’s so much charm from the Ryukyu Glass Art. 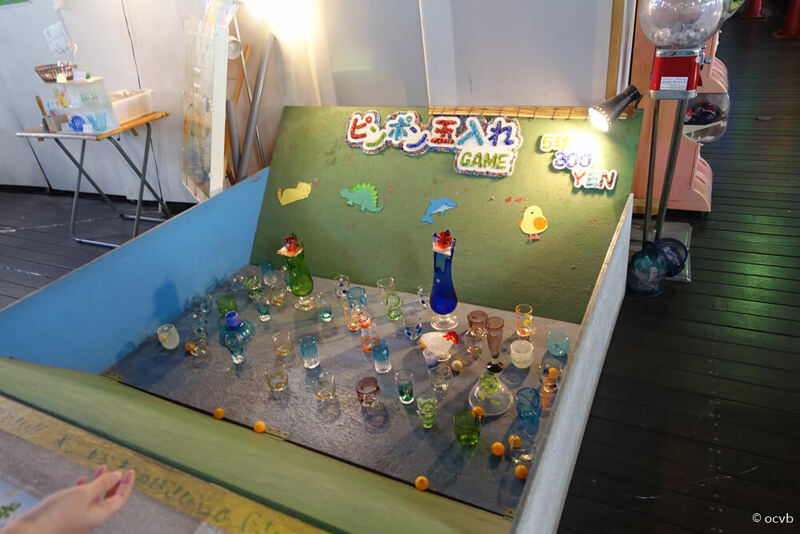 A shopping center where you can see, touch, and buy glasswork. 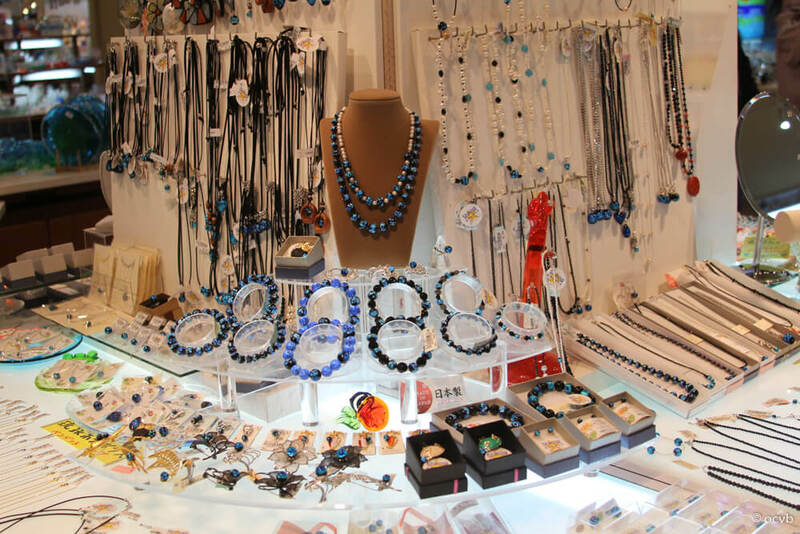 The shopping center holds a wide variety of glass products on display, from new items to the more staple ones. 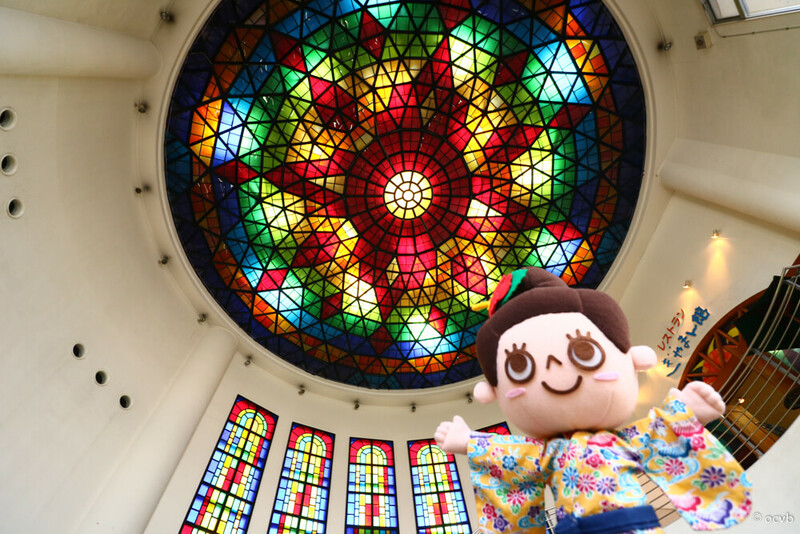 I found myself absorbed in the beauty of the colorful Ryukyu Glass! 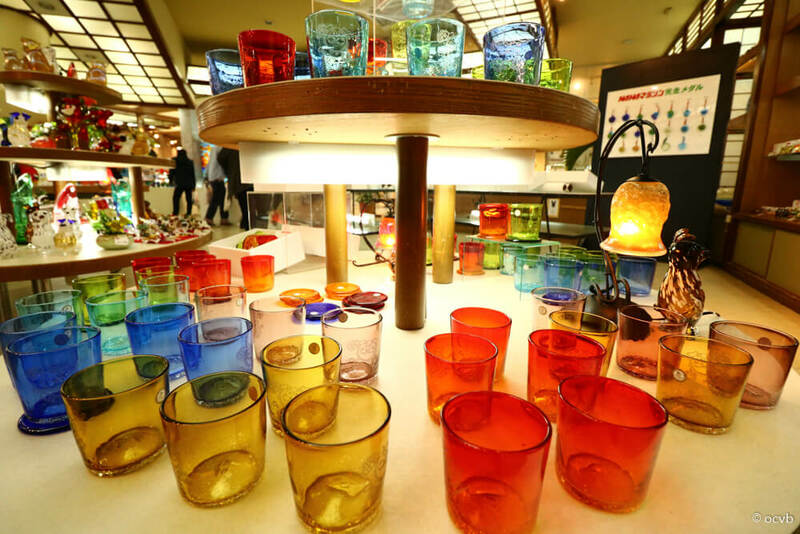 With such a wide selection of glass products, from accessories to lamps, I feel like I could look around forever! 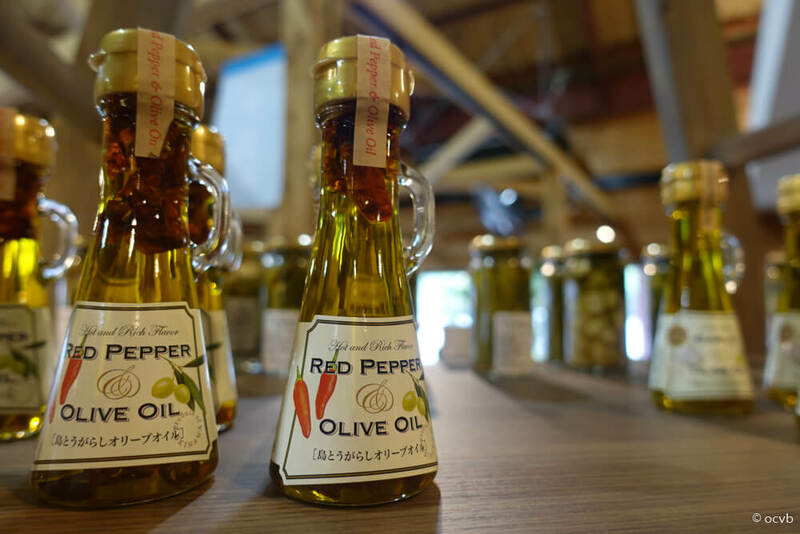 I was told that they can also ship the items you purchase anywhere in Japan! 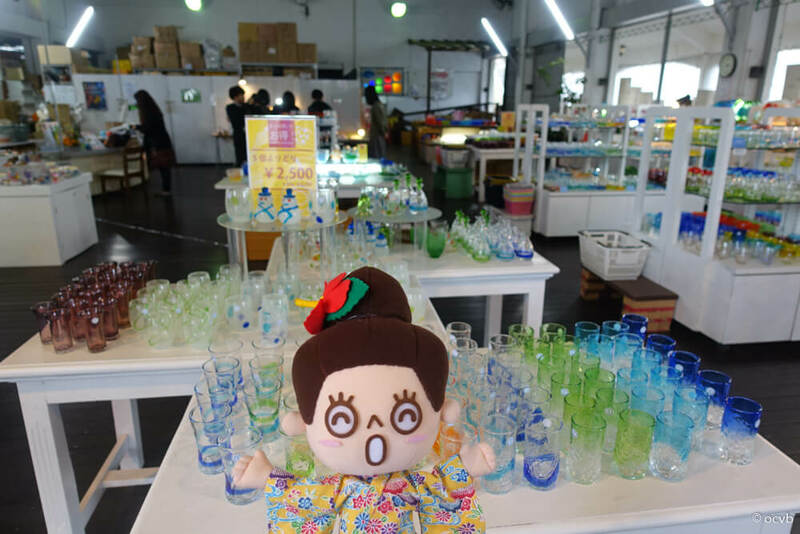 ▲ Seen here is the entrance to the glass outlet shop Jangaraya. 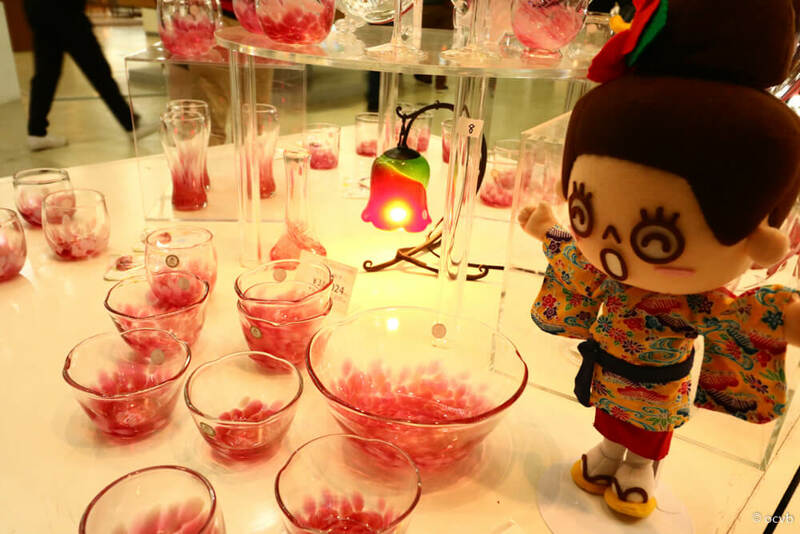 Go down the stairs leading from the shopping center, and you will see the glass outlet shop Jangaraya! which are made available at reasonable prices. 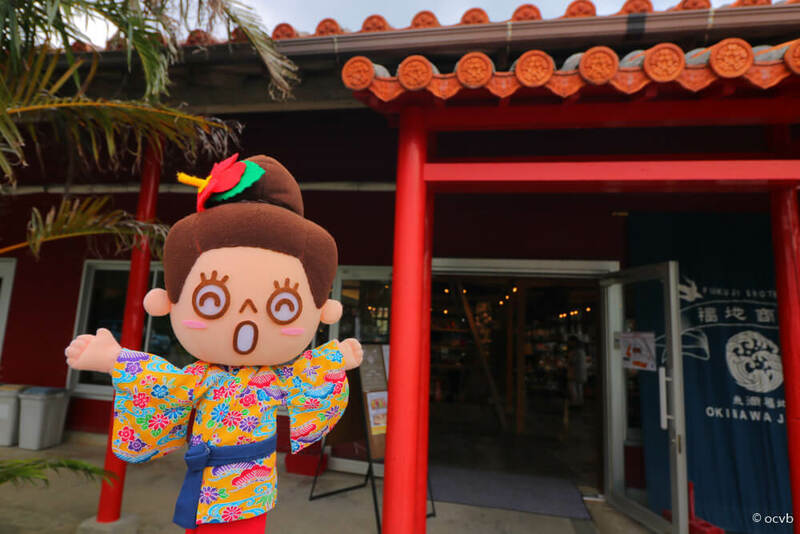 The “Ping-Pong Ball-Tossing Game” is popular at Jangaraya! If you can throw the ping-pong ball and make it into one of the glasses, you get to keep that glass.